Victor-Marie Hugo was born in Besançon as the son of Joseph-Léopold-Sigisbert Hugo and Sophie Trébuchet. Hugo's father was an officer in Napoleon's army, an enthusiastic republican and ruthless professional soldier, who loved dangers and adventures. After the marriage of his parents had collapsed, he was raised by his mother. In 1807 Sophie took her family for two years from Paris to Italy, where Léopold served as a governor of a province near Naples. When General Hugo took charge of three Spanish provinces, Sophie again joined her husband. Hugo spent the years 1815-1818 in the Pension Cordier in Paris, but most of the classes of the school were held at the Collège Louis-le Grand. He began in early adolescence to write verse tragedies and poetry, and translated Virgil. In 1819, he founded a review with his brothers, the Conservateur Littéraire. Inspired by the example of the statesman and author François René Chateaubriand, Hugo published his first collection of poems, Odes et Poésies Diverses (1822). It gained him a royal pension from Louis XVIII. As a novelist Hugo made his debut with Han D'islande (1823), which appeared first anonymously in four pocket-sized volumes, and was translated into English two years later. In 1822 he married Adèle Foucher (d. 1868), who was the daughter of an officer at the ministry of war. During 1820s Hugo came in touch with liberal writers, but his political stand wavered from side to side. He wrote royalist odes, cursed the memory of Napoleon, but then started to defend his father's role in Napoleon's victories, and attack the injustices of the monarchist regime. General Hugo died in 1828; at that time Hugo started to call himself a baron. Hugo gained a wide fame with his play Hernani (1830), in which two lovers poison each other, and with his famous historical work Notre-Dame De Paris, which became an instant success. Since its appearance in 1831 the story has become a part of the popular culture. The novel, set in 15th century Paris, tells a moving story of a gypsy girl Esmeralda and the deformed, deaf bell-ringer, Quasimodo, who loves her. In the 1830s Hugo published several volumes of lyric poetry, which were inspired by Juliette Drouet (Julienne-Joséphine Gauvain), an actress with whom Hugo had a liaison until her death in 1882. Hugo himself was seen by his fans a Gargantuan, larger-than-life character, and rumors spread that he could eat half an ox at a single sitting, fast for three days, and work non-stop for a week. In his later life Hugo became involved in politics as a supporter of the republican form of government. After three unsuccessful attempts, Hugo was elected in 1841 to the French Academy. This triumph was shadowed by the death of Hugo's daughter Léopoldine. She had married Charles Vacquerie in February 1843, and in September she drowned with her husband. It took a decade before Hugo again published books. After he was made a pair de France in 1845, he sat in the Upper Chamber among the lords. Following the 1848 revolution, with the formation of the Second Republic, Hugo was elected to the Constitutional Assembly and to the Legislative Assembly. When workers started to riot, he led soldiers who stormed barricades in brutal assaults. When the coup d'état by Louis Napoleon (Napoleon III) took place in 1851, Hugo believed his life to be in danger. He fled to Brussels and then to Jersey. When he was expelled from the island, he moved with his family to Guernsey in the English Channel. Hugo's partly voluntary exile lasted for 20 years. During this time he wrote some of his best works, including Les Châtiments (1853) and Les Misérables (1862), an epic story about social injustice. Les Châtiments became one of the most popular forbidden poetry books. Like other Romantic writers, Hugo was interested in Spiritism, and he experimented with table-tapping. After a number of fruitless efforts, his table gave him the final title of Les Misérables. Among Hugo's most ambitious works was an epic poem, La Fin de Satan, a study of Satan's fall and the history of the universe. The poem was never completed. Although Napoleon III granted an amnesty to all political exiles in 1859, Hugo did not take the bite. Les Misérables appeared with an international advertising campaign. The book divided critics but the masses were enthusiastic. Pope Pius IX added it with Madame Bovary and all the novels of Stendhal and Balzac to the Index of Proscribed Books. Hugo's fleeting affairs with maids and country girls inspired his Les Chansons Des Rues Et Des Bois (1865). Les Travailleurs De La Mer (1866), a story of hypocrisy, love, and suicide, became a bestseller and later two films were made of it. Political upheavals in France and the proclamation of the Third Republic made Hugo return to France. The unpopular Napoleon III fell from power, the Republic was proclaimed. In 1870 Hugo witnessed the siege of Paris. 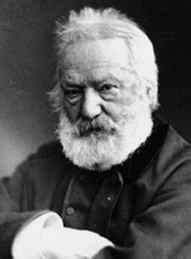 During the period of the Paris Commune of 1871, Hugo lived in Brussels, from where he was expelled for sheltering defeated revolutionaries. Hugo's attitude to the Commune was ambivalent: "An admirable thing, stupidly compromised by five or six deplorable ringleaders." After a short refuge in Luxemburg, he returned to Paris and was elected a senator of Paris in 1876. Hugo died in Paris on May 22, 1885. He was given a national funeral, attended by two million people, and buried in the Panthéon. Quasimodo, a hunchback, loves Esmeralda, a gypsy, but she is in love with Phoebus.